Home › Home and Kitchen › Wine Aerator - Yukiss Premium Wine Decanter Pourer And Breather Excellent For..
Wine Aerator - Yukiss Premium Wine Decanter Pourer And Breather Excellent For.. INNOVATIVE AND ELEGANT DESIGN - Fits on any Wine Bottle, High Quality Suitable for Gift. NO WORRY - Keep Your Tablecloth Safe From Wine Stains. 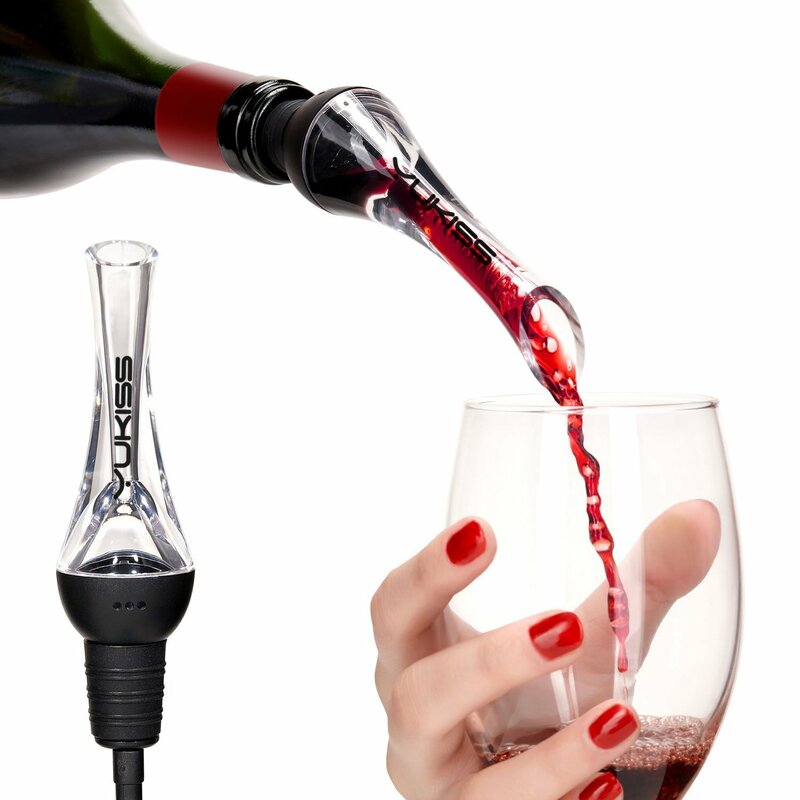 NO WAIT - Aerate Your Wine to Perfection Instantly. PORTABLE - Compact Portable Size Makes Easy for Travel - NO Stand Needed. NOT SATISFIED WITH YOUR AERATOR? 60Days No Reason 100% Money Back Guarantee. We all know that wine needs time to breathe but what happens when you forgetto open the bottle in advance, or you simply don't have time? Today's fast pace of life means that we don't always have time to preparethings well in advance, and wine is no exception. Traditionally a decanter isused for wine aeration but now there is no need for such a time consumingstep. Aerating Pourer is a example of contemporary style and utility. We've found itis no longer necessary to sit and wait for our bottles of wine to breathe!Just pop the cork, put on the aerating pourer, and the wine is ready to pourand drink instantly. Not only do we love it, but so do our guests!! So Why Choose The Yukiss Wine Aerator? Here Are The Benefits... Simple to fit! The Yukiss Wine Aerator fits snugly into your wine bottle with an air tight seal, meaning no drips when you pour that perfect glass of wine! Easy to clean! There's no problem cleaning your wine aerator so you can enjoy perfect glasses of wine time and time again. Replaces time consuming decanters. Aerate your wine to release aromas and flavors as you pour. When the wine flows through the wine pourer, the unique regulator wouldregulate the flow into a cavity, for the wine to touch air first, and thepoint of aerating of wine and air, bubbles would be formed indicating theprefect wine aeration. Finally when the wine flows out from the trumpet shapedspout, the tannins that would affect wine tasting have been oxidized andreduced, thus the flavor and bouquet of wine is well enhanced. How To Use: Connect the air tube with the wine pourer. Insert into the wine bottle. Pour wine as usual.